B&P Littleford’s CT series extruders are engineering work horses for high torque, high speed compounding applications such as alloying, filling, mixing, reinforcing, and compounding of masterbatches and color concentrates. Designed specifically for the high-torque, high-speed demands of thermoplastic compounding applications, the CT Series twin screw compounder features modular, sectioned barrels and screws for easy adaptation to your processing and mixing demands. Enhanced torque capability of the entire drive train utilizing a high torque gearbox and patented sinusoidal shaft design. Wide range of proven metallurgy options for segmented barrels and screws to ensure superior wear and corrosion resistance. Electrically heated barrels with internal cooling for precise temperature control. Wide range of configuration options and supporting ancillary equipment such as side feeders, vacuum vent stuffers, and customized control systems available to suit your application. For effective wear protection adapted to the process, either nitriding steel, 440C hardened steel or powder metallurgy steel barrel of 4 L/D is used. The various screw elements of the CT series with a Do/Di of 1.55 can be functionally extended and are tailored to fulfill standard compounding unit operations. Specially adapted upstream and downstream process components, such as various feeding and pelletizing devices, expand the CT series extruders into complete systems. 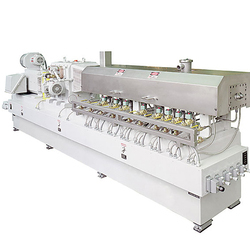 For many compounders, our CT series twin screw extruder is an ideal fit for their immediate and future growth plans. Six CT series extruder sizes are available with screw diameters ranging from 26mm to 133mm. Modular configurations in air or water-cooled AC motors, with two screw speed options at 600 and 1200 RPM, provide for enhanced efficiency, robust performance and cost-effectiveness. Typical applications include: Fiber grade Polyester, Polyethylene masterbatches, polymer blends, automotive compounds, short fiber reinforced thermoplastics, PP impact modified, Color Compounds, and TPVs. Contact us for more information on how your product will run through this machine or to set up a test in our Saginaw, MI Tech Center.